If there is one thing I have learned about having a homestead is you need a plan at all times. I used to fly by the seat of my pants, but I soon learned while that may be okay for running a household it did not work so much with a homestead. I needed to learn planning projects on the homestead. There are simply too many things that need to be done at certain times throughout the year and too many animals that need routine attention that simply cannot be skipped or looked over. Having a schedule of things that need to be done or at the very least paid attention to is an essential part of homesteading. The next step to this plan is finding a way to schedule out things so you 1. have the money needed and 2. have the time set aside. Money and time are two things this homesteading girl does not have a lot of. By having a schedule you will be able to financially prepare for those big costly projects. Time can be a bit more tricky to find, however, if you know in advance a big project is coming up you can adjust your daily schedule in a way to make room for a project. If you have read any of my productivity articles then you know how I like to break things down into steps. If not take a minute to jump over and read my best tips on productivity. This article will give you some basic yet powerful ways to get more done in less time. By breaking a large project down, you are eliminating the overwhelm that these projects tend to bring. 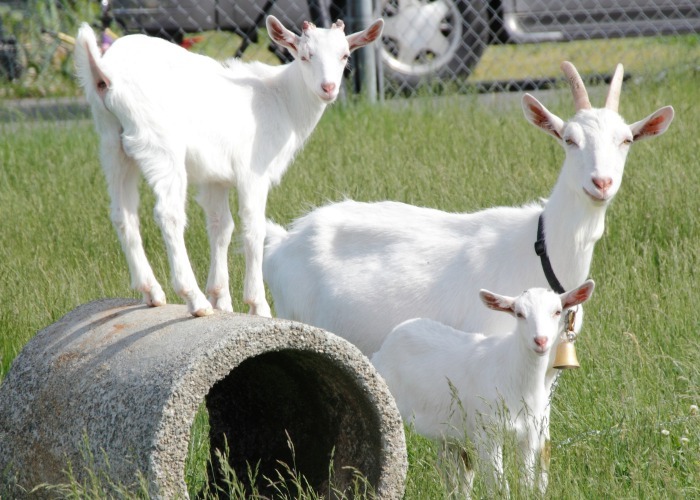 Breaking things down and having a schedule are the keys to productivity on the homestead. Hubs and I have found over the years that the best way to create a homesteading project schedule is to make an initial list annually that is done monthly. We then revisit it quarterly so we can make adjustments. This gives us a great jumping off point for our homesteading finances. Knowing right away that I will need a certain amount for each month’s list of projects gives me all the information I need to create a financial game plan I can follow throughout the year. Okay, before I get into my rambling mode let’s get a checklist going to make things a bit easier. How to Plan Projects on the Homestead! Trust me this is important. Make sure you are both there and completely present. Hubs and I plan on at least 1/2 a day with lunch or dinner as our reward. This really ensures we are both there 100% without any outside distractions. I know coming up with a day just to plan seems like a lot but it will be totally worth it. Spending that day now will save you hours and hours of time, not to mention money in the long run. Look at is an investment in your homestead. Another tip is to clear the house. If you have little ones make sure you have something for them to do. By keeping them occupied you can put all of your attention into planning. You will need a couple of tablets, pens, pencils, highlighters, your calendar, your budget, and plenty of coffee (or beer if you are my Hubs). Get everything you need ready to go before you dive in. I have learned that a quick trip to the kitchen to get a pen can end up in a 15-minute sidetrack that will derail this whole project. Another tip is to find a place that you can spread out, like the kitchen table or the office if you have one. So does Hubs, to be honest. Getting every little thing out of our heads and onto paper is so incredibly therapeutic. The sky is the limit and no project is too small or too crazy big at this stage. The key here is to write it all done…every…single….thing. Call this your Homesteading Bucket List and I want you to go crazy! Each of you should take a tablet and pen and just write. Put down every single project you would like to get done during the upcoming year. Just list them all and don’t worry about time, money or manpower at this point. Take turns reading your planning projects lists out loud. Cross off any duplicates the two of you may have. Once finished go back and talk a bit about the projects. Which ones are just not doable at this time? Which ones are pipe dreams for far off into the future? Eliminate anything you truly know you will not be able to get to. We want this list to be realistic so you need to get real and make some hard choices before we move on. Now revisit your finalized list and assign a month to each project. As you are doing this you may see a few more projects that you just cannot get to this year. Don’t get stuck on this, simply remove them for another time. Some projects will have specific months where they must be completed while others are a bit more flexible. Once every project is assigned a month, take a look at things. Make sure you do not have too much scheduled for a particular month. We want this to reduce stress not create it. By keeping your months consistent with your planning projects you will avoid homesteading burnout. If you are anything like me, you need the visual to make it work. Take 12 sheets of paper and write the month at the top of each sheet (or print out my freebie and use some of that awesome goodness!). Now look at your main list and transfer each project to the monthly sheet it is assigned to. Once you are done, look at each month. Now you will be able to see if a month is “heavy” and simply not do-able. Or, if another month is “light” and you can move one project from a heavy month to balance things out more. Are you beginning to see the beauty of this system yet?? Pretty amazing isn’t it? Well, wait…it’s gonna get better! Once you have your months assigned, cross check things with your calendar. Be sure you pay attention to busy months and adjust your projects accordingly. If you have kids leaving for college in August, for example, you may not want to schedule a barn addition for that same month. Be aware of what you already have planned so you can tackle each month without stress or overwhelm. Step #8. What’s this gonna cost me? When you have your months completed and finalized it’s time to move on to the money. Go through each and every item and jot down an estimate of what you will need money wise to complete. Be sure to take advantage of what materials you have on hand and only buy what is absolutely necessary. We are homesteaders after all and spending money is only used as a last resort! Once you have assigned a cost to each homestead planning project, do a tally and jot the total on the upper corner of each monthly sheet. This number is your goal money to have saved and ready to go prior to the start of that month. Now depending on how you budget, you may want a monthly number, a quarterly number or an annual number. Whichever you choose, get that number down and set in stone. From this point on, no changes (financially at least) can be made so make sure you are both in agreement before finalizing and moving on. Take those numbers from step #8 and transfer them to your household budget. If you do not have a homestead slush fund, then you will need to make adjustments so you are able to put money aside for your upcoming projects. Find places you can cut or reduce so you are better able to save the money you need. The whole point of this system is to keep projects from becoming debt makers. READ: LIVING PAYCHECK TO PAYCHECK? NINJA TIPS FOR SAVING MONEY! Can you spend just $50 less each month on groceries? How about an odd job or two to make the money needed for a larger project? Or you can sell a few of your homesteading products at the local farmers market or auction house. It is amazing how you can come up with a little money when you are open to thinking outside of the box. This may sound like a small tip but actually, it’s huge. I have a pretty large bulletin in our office and I put every single month on it. As we complete a project I simply cross it off with a highlighter. Tip: Leave the months up there, even after they are over. Seeing all you are accomplishing as the year goes on is a huge motivator to keep going. Finally, at the beginning of each new month, take all the projects you have scheduled and assign them a day or a weekend if they are larger. Start with the most important projects for that month and work your way to the least. Plan on time to get materials bought and/or gathered and set up help if needed. By preparing each month this way you will have smooth sailing year round. If any projects do not get completed then you can either move them to another month or, if possible, save them for the next year. By having a system for planning projects on the homestead you will be surprised at all you can accomplish. Hubs and I have been doing this for years now and we are so amazed by the results. We now do the same for our home projects as well. No more are we running around without a plan having no idea what to do next. Things are no longer falling apart or being forgotten. We are back in control and the stress is just about gone. Give this super simple system a try. 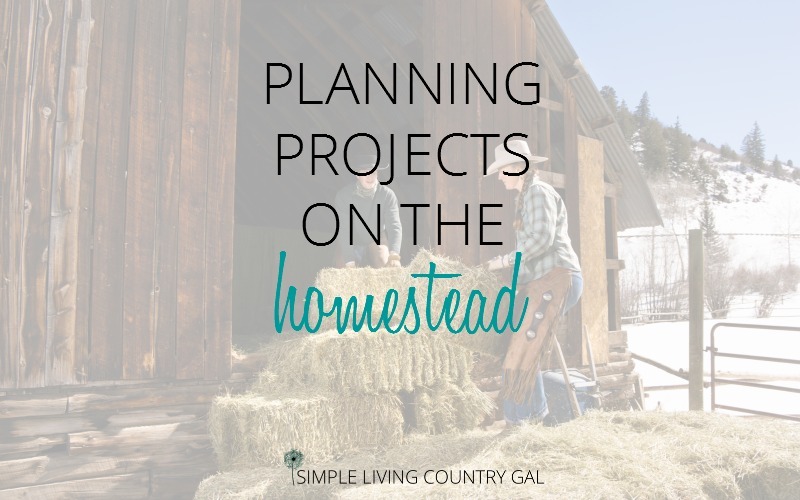 You will be amazed how well planning projects will work for you and your homestead. « How To Get Your Blog Live TODAY. A Step By Step Guide.